Rest in peace in the dead centre of Kumara. Historically the 1877 Undertakers, this four bedroom cottage has either private or shared rooms available as backpacker accommodation. The old Undertakers is essentially a place for Backpackers travelling on a budget. The cottage is a secure and comfortable place to rest in peace in the heart of historic Kumara – a small town with big local character. Our staff are friendly, helpful and a great source of knowledge. They will take the time to fill you in on a bit of local history. We want to share our stories, hear yours and provide a feel of Kumara and of what the old town was like in New Zealand’s gold rush era. Staff can provide you with information and free activities or excursions, like a self-guided walking tour, exploring glow worm caves or venturing out into the West Coast Wilderness cycle trail. After a bike ride you’re bound to be thirsty! So pop into the bar across the road, find a local drinking buddy to spin a yarn to and use the free Wi-Fi. The cottage has four secure bedrooms with locks on doors, power outlets beside the beds, a cosy common living area with comfy couches for lazing on, a full kitchen, shared bathroom/laundry and clothes line, a log burner and DVDs for wintery days or when the weather is fine open the french doors out onto the back lawn where you can play a game of darts or pick up some beers from the Hotel, chill out and make the most of the West Coast sunshine. The cottage is basic, we provide the essentials. Linen is provided and towel hire is available from the Hotel. Wi-Fi is not available in the cottage itself but in the hotel bar. Ultimately we want to create a relaxed and social atmosphere for backpackers and travellers. The Undertakers cottage, like Kumara, has character. 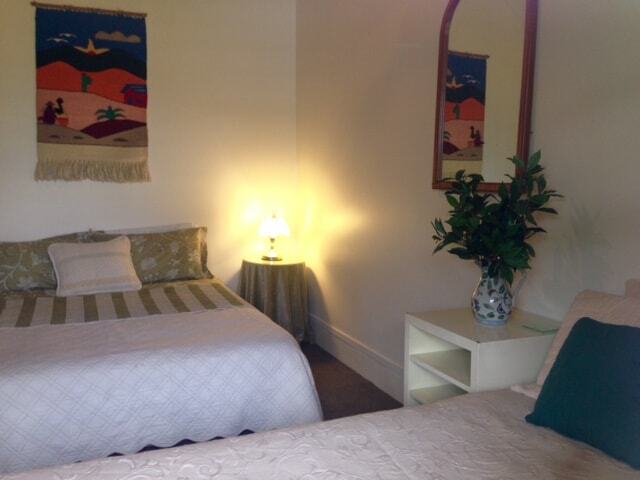 If this doesn’t sound right for you or if you would prefer a room with a private ensuite we recommend upgrading to a room McEnaneys Cottage, also located across the road from the Hotel at a rate of $120.00 for two people.